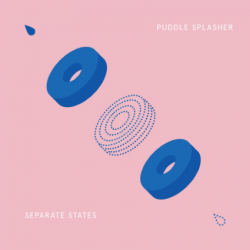 New Jersey’s Puddle Splasher release their new album Separate States on 8th July via Animal Style Records. Fusing elements of 90s emo, grunge, shoegaze and alt rock it’s an album that veers from the thrilling and pulsating to the unremarkable and bland. As such it’s a hard album to get on-board with and enjoy. It’s so much of a mixed bag that you get the feeling that the band don’t really know what their sound should be. At times Separate States feels directionless, songs like ‘No Leaves’ and opener ‘Summer Sigh’ sound a little messy, the indie jingle jangle is at odds with the strained vocal. With some bands it can be a sound that works, unfortunately not with Puddle Splasher. If sub-standard 2000s Stereophonics is your thing then you’ll love ‘I’m Hurting Me’. It plays like homage to the most middle of the road Dad rock imaginable while ‘Dead Afternoon’ tries to channel to vocal talents of Thom Yorke and mimic the gusto of OK Computer coming up short of the finish line. Even the worst parts of Separate States don’t fit well together; it doesn’t flow, veering too radically from one sound to another. ‘Good News’ bridges the chasm between the sublime and the rest of the album. Falling in-between the two parts it sums up the best and worst of Puddle Splasher. The chorus is big and anthemic, a call to arms of the disenfranchised, with powerful guitars to match. Conversely the guts of the song meander through weak vocals and plodding guitar parts. Then there’s the moments where you think Puddle Splasher might be contenders to be your new favourite band. Songs like ‘Different Life’ and ‘Decent Thoughts’ are commanding and rousing. There’s a genuine ballsy energy that simmers and explodes in bursts of big grungey guitars and soaring vocals. The former is particularly striking with its guitar solo that mixes tones of big American emo with accessible grunge while the latter takes parts of new Title Fight mixed with a delectable and instantaneous hook and chorus. Team that up with the high energy indie-punk of ‘Healing Problems’ and churning and soaring guitars of ‘Not A Word’ and you have the basis of a very good album if only the rest came close. Separate States puts Puddle Splasher forward as a band that have talent and the potential to go places if they can nail down a sound. As an album Separate States shows the very best and worst of the band. Pick your track listening selectively and you might just enjoy it.